Stations are habitable structures for humans in space. They are specialized to produce certain goods. Ships can dock to gain access to station services. The services include accepting missions, passenger contracts, buying or outfitting ships, clearing and collecting bounties, paying fines, refueling, repairs, trading (legally and illegally), and hiring crew. Stations are equipped with defence systems to deal with criminals and smugglers. Defence Turrets are lethal and can destroy any ship in a matter of seconds. Some stations rotate to provide centripetal force to simulate gravity for the people aboard. The exterior and interior appearance of a station depicts its specialized economic output. There are several variants of each model. For example, towns and farms are visible in agricultural hubs of Orbis models. The amount and quality of available services at a station varies. 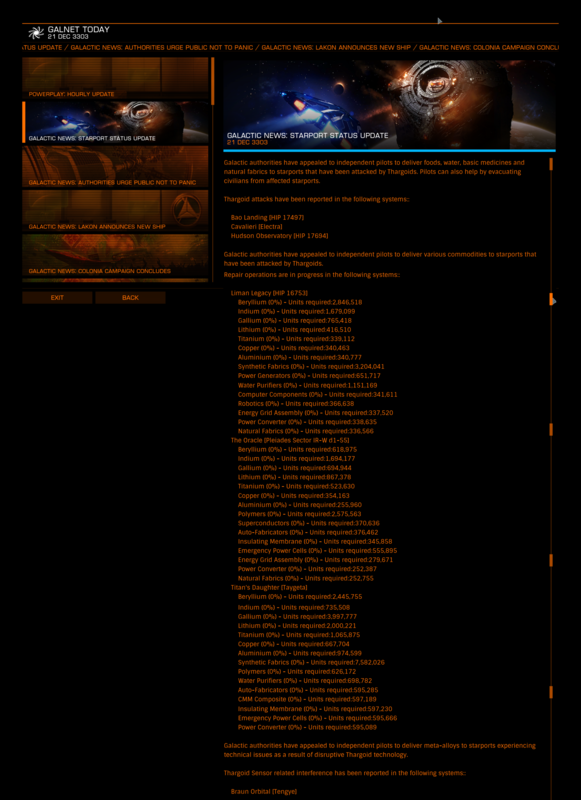 Under certain extreme conditions, such as when a large quantity of Thargoid Sensors or Probes has been sold on a station's black market, causes most or all services (e.g. refueling), to be disabled. Two station types, Capital Ship Docks and Installations, offer no docking facilities nor services. Starports such as the Coriolis, Orbis and Ocellus are a safe haven for pilots amid the vastness of space. They are very big; an entire city floating in space and slowly rotating to create artificial gravity for the traders, pilots, tourists and citizens aboard. Millions of people live and work there. Gravity differs between each tower's floors. For many residents real daylight is a rare privilege. The landing hub is pressurized with an atmosphere. The docking hub is a safe zone, because no firing of weapons is permitted. Defensive turrets protect it and uphold the law. Nearly all ships and stations are standard fitted with the GalNet system for market information, galactic news and communication. There are six station interior types for Coriolis, Ocellus, and Orbis stations: Standard, Wealthy, Tourism, Refinery, Tech, and Agriculture. A station's interior is determined by its star system's type, economy, and population. Asteroid Bases are a fourth station type that always have the same interior. To dock with a station, pilots must first request docking permissions by accessing the navigational terminal's "Contacts" tab. Pilots farther than 7,500m from a station will be automatically denied access and asked to approach to said distance first. In heavily populated or lagging instances, all ports may be occupied and a permit will be denied. Once granted, the pilot will be assigned a landing pad number to approach and land on. If the pilot does not land within the allotted time slot [usually 10 minutes], the pilot will have to exit the station and request additional permissions. Attempting to dock without permissions will trigger a lethal response within 60 seconds. This includes docking on the incorrect landing platform. If docking control responds with a generic "docking request denied" message, then it's likely all landing pads are occupied. One can circumvent this by logging out of the open play and into solo play will usually fix this. Once docked, you can switch back to open play. Upon undocking from your landing platform, you will have 5 minutes to exit the station before you are considered a loiterer and a 60-second hostility timer begins. To either side of the docking port are lights coloured green and red. Pilots should approach on the side with the green lights to reduce the chance of a collision. Ships enter and exit stations via the Access Corridor. This is an airlock that serves as the main point of entry for Coriolis, Ocellus, Orbis, and Asteroid Base stations. Players can purchase and store additional ships at each station and switch freely between them when docked. These can be accessed from the shipyard section of the starport services screen. All stations have an area surrounding them designated a no fire zone. You are notified each time your ship enters and exits this area. You will also receive a message when your ship enters this zone to retract your weapons, should they be deployed at the time. If you should fire any of your weapons within the no fire zone you will be fined. Station defences will activate and open fire on your ship if your weapons hit the station or any ship that is not wanted in that jurisdiction. Using any scanner within the no fire zone is perfectly legitimate and legal. Dumping any cargo within the no fire zone will get you fined, except while docked in the station. While Outposts and possibly Coriolis stations are constructed in orbit where they are needed, Ocellus and Orbis stations are partially constructed elsewhere, transported to their destinations, and then completed. The Ocellus and Orbis dock enclosures are built first, then attached to an engine assembly that allows them to jump to the final build site. Upon arrival, the docks are opened to the public for docking, but remain stationary. The engines are eventually detached, and a spire built along the dock's rear axis to accommodate habitation rings, solar panel arrays, the main reactor, and other modules. Once the station's modules are completed, the station enters rotation and is considered fully online. Coriolis, Ocellus, and Orbis stations activate emergency protocols in the event of a direct attack that renders them too dangerous to inhabit. Attacks on this scale were apparently rare until December 14, 3303, when a number of stations in the Pleiades Nebula were devastated by Thargoids. Stations that have become damaged enough to trigger emergency protocol display a "Damaged" marker on the Galaxy Map and System Map. Refueling, Maintenance, Contacts, Universal Cartographics, and the Crew Lounge are disabled at these stations. The Missions panel is accessible, but no missions are on offer. The Passenger Lounge offers several contracts to transport refugees to the safety of a nearby Pilots Federation Rescue Vessel. The Commodities Market is damaged, and only accepts certain emergency supplies. Standard Docking Computer functionality is also disabled, forcing pilots to use manual controls if they wish to dock. If a player was docked at a station that becomes damaged, they and their ship will be transferred free of charge to the Rescue Vessel. These are Search and Rescue activities. Affected stations exhibit severe structural damage, corrosion from Thargoid weapons, fires, and the main reactor module at the far end of Orbis and Ocellus stations is breached; approaching the reactor will disrupt ship HUDs. The docking bay is lit by red emergency lights and littered with floating debris and salvageable commodities. A hazardous level of heat has built up that can easily overwhelm ships that linger in the docking bay too long, and sudden explosions can knock ships off-course at inopportune moments. Heatsinks, Shield Generators, and Auto Field-Maintenance Units are strongly recommended. Penalties for violating a station's No Fire Zone are partially reduced for the duration of the crisis; firing weapons, either into space or at a wanted CMDR, results in only a fine, but targeting the station or a clean CMDR still triggers a lethal response from the station's defense batteries and security forces. Releasing cargo inside the station also still results in a fine per unit dropped. CMDRs should be wary of Cargo Hatch malfunctions caused by heat damage, especially if they are carrying valuable cargo they do not wish to lose. The following week after a station is damaged, it enters a Repairing state, which is also marked on the System Map and Galaxy Map. Emergency protocol is scaled back, evacuation missions cease, and the Rescue Vessel departs. The docking bay is also stabilized and cleared of debris, and repair work is visible both there and on the station's exterior, but many services and autodock functionality remain disabled. During this phase, the station requires large quantities of 15 different commodities in order to conduct repairs and fully restore all services. These commodities are listed within GalNet Starport Status Update reports, and can be delivered simply by selling them on the Commodities Market. Stations remain in the Repairing state indefinitely until all requested supplies are delivered. There are occasional community goals to upgrade a station. Upon winning the CG a station is granted some special upgrades. For example Greeboski's Outpost in the star system: Phiagre received more and better modules than previously available and the interior and exterior design changed. It is an Industrial economy station, but has the interior of a service economy. Exterior wise it received a big habitation ring. Jameson Memorial - Orbiting Founders World in Shinrarta Dezhra, Jameson Memorial has all ships and modules available for purchase at a 10% discount. Pilots must reach the rank of Elite or be a Kickstarter backer in order to get a permit to access Founders World. Attilius Orbital - Located in the permit-locked CD-43 11917 system. The permit is only given to pilots who achieve "prestige" rank in CQC. The station offers various ships at a 20% discount, and various modules at a 30% discount. Obsidian Orbital - Built in late 3301 in the Maia system, Obsidian Orbital was the first station constructed in the Pleiades Nebula, and the reward for a Community Goal. Jaques Station - Owned by the cyborg bartender Jaques, Jaques Station attempted to jump to Beagle Point in 3302, but Thargoid Sensor-induced malfunctions knocked it off-course and it arrived in the Colonia system instead. Pilots across the Core Systems rallied to the station's aid, leading to the colonization of the Colonia Region. Cavalieri in Electra, a Coriolis with four "arms"
↑ Frontier Forums: Starports "Under Repair": change to visibility of progress.